In June 2017, Health and Family Planning Commission of Wuhan City issued the “notice on specialist list of the key clinical specialty and municipal key clinical construction Wuhan City of in 2017”, (Health and Family Planning Commission of Wuhan City  No. 34), China Resources Phoenix Medical shareholding Co., Ltd.(hereinafter referred to as "China Resources Phoenix"or "Group"), its rehabilitation department, vasculocardiology department, department of hemopathology and urinary surgery department of China Resources Wugang General Hospital was awarded key clinical specialties of Wuhan City. China Resources Wugang General Hospital pays high attention to this review with well-organized, selection mechanism of key specialist is established in the hospital, the hospital gives fully play various departments initiative to create a key clinical specialty. 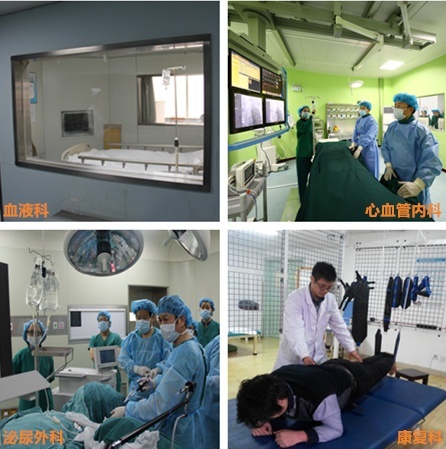 There are seven clinical specialties to file an application in the whole hospital, selected by the hospital, rehabilitation department, vasculocardiology department, department of hemopathology and urinary surgery department stand out, and participate in review of key clinical specialties of Wuhan City. During the assessment process, Health Planning Commission of Wuhan City conducts the review by the means of data report analysis, centralized reply, unannounced visits and examination. In the field assessment link, the groups of review experts refer to department information meticulously go deep into departments and communicate with on-site doctors and nurses, they speak highly of the four specialties construction with full recognition, and the hospital ultimately passed the review and was awarded key clinical specialties of Wuhan City. Discipline construction is the basis of hospital construction and sustainable development. It is the driving force of hospital construction and sustainable development. It is also the basic work of driving the whole group. As always, China Resources Phoenix attaches great importance to the construction of hospital disciplines. At the beginning of each year, the Group and the various member hospitals sign a responsibility agreement of performance appraisal, not only have a rigid requirement within discipline construction of the hospital in the index system, but also increase by awarded marks outside the index system, improve recognition level on discipline construction and lead to a large number of rapid development of disciplines. There are 4 specialties access to key clinical specialties qualifications in China Resources Wugang General Hospital. It is not only the full recognition of the construction discipline of the hospital, but also the encouragement of China resources phoenix to strengthen the discipline construction, which has added a lot to the discipline construction of the group. The group will take this as an opportunity to lead its hospitals to strengthen the construction and management of clinical key specialties. Strengthening support in the talent team construction, equipment configuration, new technologies and new business development, at the same timegiving full play to the driving and exemplary role of key clinical specialty, which helps to meet the demands of seeing the doctor of patients by constantly improving the ability of department management , healthcare service level, and technological innovation, as well as enhancing core competencies of hospital .